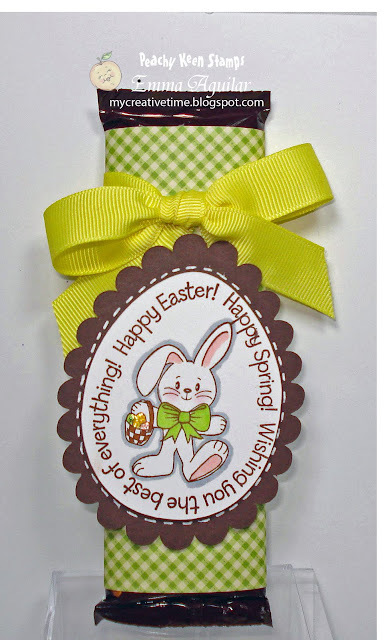 My Creative Time: Easter Candy Wrapper! Happy Tuesday everyone!! Thank you for joining me today w/my "4th" video!! Can you believe it?? I can't! I am LOVING this, it's time consuming, but worth it! Today's video will be featuring Peachy Keen's newest stamp release called: "Easter Egg Words & Bunnies" I will be making a cute candy bar wrapping using this AWESOME stamp set! I hope you enjoy it! Emma, So super cute. I just love that stamp set. Forget chocolate, I'm addicted to your videos!! Lookout!! I will be blog stalking you ;P!!! What type of markers are you using? I am just getting into stamping and don't know what type of markers to use. Your help would be greatly appreciated. This is for my "Anonymous" commenter, I used copic markers, MY FAVORITE!!! Emma, Sooo cute! and my son said "tell her she IS a good colorer!" Another great video and your candy bar wrapper is so CUTE!!! Oh Emma!!! This is so so so cute! Another awesome video. This is so INCREDIBLY CUTE!!! I love it! Thanks for all your hard work and sharing your creative time :). Oh how great. Your coloring is gorgeous. I love that you used dollar store ribbon, it looks great. Sometimes you can find such great things there! Thank you for your videos, I can't wait for more. I don't have a gypsy yet, maybe soon! Thanks for stopping by my blog.. oh I just love the candy bar video.. it is on my list to do. Well, aren't you just a Video Vixen now? Your videos look GREAT, Emma! I'm so proud!!! Thanks for the gel pin tip. I seriously thought you were sewing (with a machine!) the stitches on all of your stitch designs on your cards. Love your new videos, they are so easy and clear to follow. Thanks for showing the basics on the Gypsy, I may have to get myself one now!! Awwww! Thanks for making me want a Gypsy now! ha ha But it will have to wait awhile...a long while! :( I guess you need to make more videos! ha ha Mahalo! WOW!! Super cute!! What a great idea and I learned something new that I could do on the gypsy. Make my scalloped circle into a scalloped egg:-) Thanks for doing these Emma, I really am enjoying. How stinkin cute ! Love it !! Love it ! TFS ! Wow!! Love this project. I also love that feature on the Gypsy. I use it all the time. Plus I drag the shapes over each other to get it the way I like it. Isn't the Gypsy just the best?